Win Free Stuff From Jolly Jump Inflatables - Jolly Jump Inflatables: Party Rentals Columbus, GA - Bounce Houses - Water Slides - Auburn, Opelika, Phenix City and Fort Mitchell In Georgia and Alabama. Jolly Jump Inflatables is giving away all sorts of prizes all season long! Including, but certainly not limited to, gift certificates, coupons, and free rentals. All you have to do is go to our Facebook page sign up! Moms Earn Points Get Free Gift Cards Instantly! Everything is run through our Facebook page, Facebook.com/JollyJumpInflatables. All you have to do is become a fan, all fans are eligible for all prizes and contests! 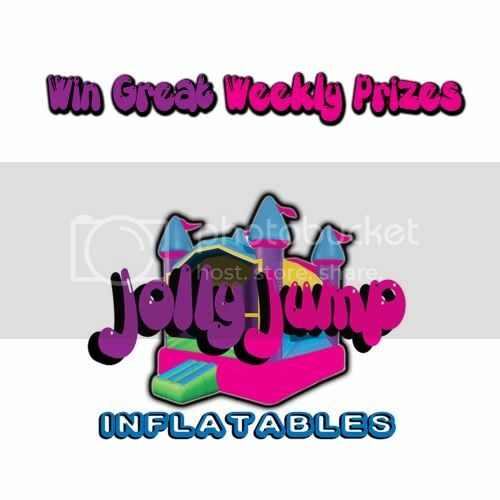 Jolly Jump Inflatables will pick one (1) winner each week at random, notify them via email and post their name on the Jolly Jump Inflatables Facebook page every Friday. Entrants must live in USA and be over 18 years of age. Jolly Jump Inflatables has sole discretion over prizes and winners. You only need to enter once to be eligible for all weekly giveaways. Jolly Jump Inflatables reserves the right to end this promotion at any time. For any questions of concerns, email winner@jollyjumpinflatables.com. This promotion is in no way sponsored, endorsed or administered by, or associated with, Facebook. You are providing your information to Jolly Jump Inflatables and not to Facebook. The information you provide will only be used for the Jolly Jump Inflatables weekly giveaway. Basically, you become a fan and are eligible to win free stuff automatically. Also, by being a fan, you let us tell others about the sweet stuff you won!